The Accidental Prime Minister starring Anupam Kher as former Prime Minister Manmohan Singh is all set for a smooth release on January 11. Here is a look at who is playing who in the political drama. Anupam Kher shared this photo of the entire cast of The Accidental Prime Minister. 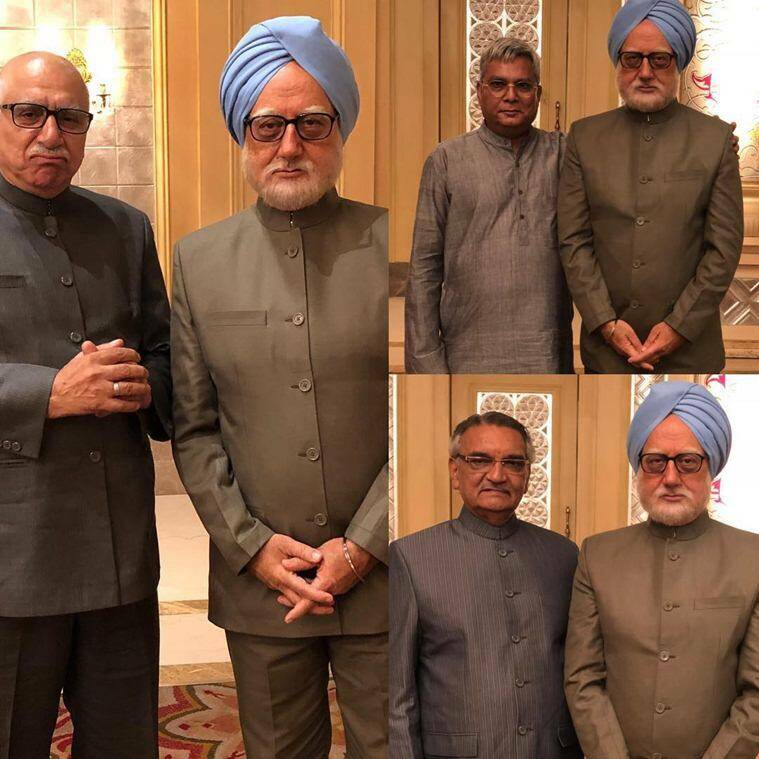 Anupam Kher, who plays former Prime Minister Manmohan Singh in The Accidental Prime Minister, introduced the entire cast of the movie during its filming stage. Helmed by debutant Vijay Ratnakar Gutte, the film is an adaptation of Sanjaya Baru’s memoir of the same name. The movie chronicles the political life of former Prime Minister Dr Manmohan Singh. After the trailer launch, the film was embroiled in controversies as the opposition party objected to the portrayal of former Congress chief Sonia Gandhi and son Rahul Gandhi. Also, petitions were filed to pull down the trailer from Google and YouTube but Delhi High Court dismissed it. Now that the film is all set for a smooth release on January 11, here is a look at who is playing who in the political drama. Suzanne Bernert plays Sonia Gandhi in The Accidental Prime Minister. German actor Suzanne Bernert will be seen playing the role of Sonia Gandhi in the movie. Suzanne has featured in several Indian television shows and films. She was the first foreign actor to turn a villain on Indian television in the historical show Chakravartin Ashoka Samrat. She has been a part of popular TV shows like Kasautii Zindagii Kay and Yeh Rishta Kya Kehlata Hai. Ahaana Kumra as Priyanka Gandhi in The Accidental Prime Minister. Lipstick Under My Burkha actor Aahana Kumra is all set to appear on celluloid as Priyanka Gandhi in The Accidental Prime Minister. Thrilled to play the role, Aahana told PTI, “I would have never imagined playing Priyanka Gandhi. I was anxious to play her. This was my first big film.” As part of her research, the actor saw videos that were available in the public domain, including some of Priyanka’s interviews. “She comes across as a self-assured person who is calm. Being a public figure, she is not there in the public eye even in this age of social media,” said Aahana. Akshaye Khanna in the poster of The Accidental Prime Minister. Arjun Mathur and Ahaana Kumra in The Accidental Prime Minister. Arjun Mathur, who was last seen in Netflix film Brij Mohan Amar Rahe, essays the role of Rahul Gandhi, the President of the Indian National Congress. The actor bears an uncanny resemblance to his real-life counterpart. Mathur was previously seen in movies like Luck By Chance, Begum Jaan, Angry Indian Goddesses and My Name Is Khan among others. Anupam Kher and Divya Seth Shah in The Accidental Prime Minister. Divya Seth started her career with popular TV series Hum Log and now is all set to play former PM Manmohan Singh’s wife Mrs Gursharan Kaur in The Accidental Prime Minister. She has films like Jab We Met, English Vinglish and Dil Dhadakne Do to her credit. She also played a part in TV show Dekh Bhai Dekh. The other cast members include Avtar Sahni as LK Advani, Vimal Verma as Lalu Prasad Yadav, Anil Rastogi as Shiv Raj Patil, Ajit Sat as former Prime Minister PV Narasimha Rao and Ram Avatar Bhardawaj as Atal Bihari Vajpayee. Ajit Sat as former Prime Minister PV Narasimha Rao.